Cooking fragrant jasmine rice in a mix of coconut milk and water gives this simple side dish a luxurious, rich texture that dresses up any stir-fry or Asian-inspired main. Rinse the rice in three changes of cold water, or until the water becomes only slightly cloudy from the rice. Drain well in a sieve. Heat the ginger with the oil in a small (2-qt.) saucepan over medium-high heat until it begins to sizzle steadily and becomes fragrant, 1 to 2 minutes. Add the rice and cook, stirring, until the grains and ginger start to brown in places, about 2 minutes. Stir in the coconut milk, 1-3/4 cups water, and the salt. Bring to a boil and then reduce to a simmer. Cook until the liquid has reduced to about the same level as the top of the rice, 5 to 7 minutes. Cover, reduce the heat to low, and cook without disturbing the rice until the liquid is absorbed and the rice is tender, 15 minutes. 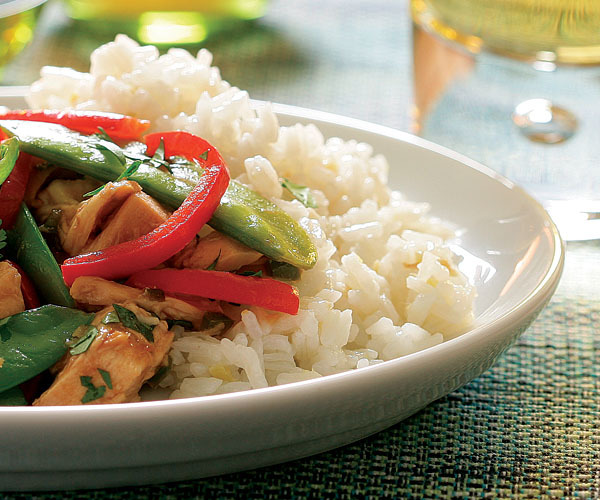 This one is another Fine Cooking Triple Threat: Easy, Yummy, and Highly Presentable! Three teenage boys made short work of the output! I went light on the ginger and the rice was perfect for my taste. Excellent dish! Used brown jasmine rice, which of course took much longer to cook, but it was still great! Made with the seared-salmon with ginger butter and the peas with mint. Everything worked together wonderfully! This recipe makes a simple, but delicious rice dish.